For the season of Advent, the Hebrew Bible texts arise from the later chapters of Isaiah. During this time period of Isaiah’s writings, the Judeans had been exiled for over 50 years in the land of Babylon. Their land was destroyed, their Temple flattened, and their faith was shaken. They had lost all hope (just read Lamentations), and believed that God might never vindicate them. At the time of this passage in Isaiah, the prophet was calling them back to the Promised Land. He was calling for comfort, for valleys to be made level with the mountains, and saying that their sins have been forgiven. Then, in the middle of all the celebrating, a voice says, “Cry out!” But the prophet doesn’t know what to cry. And the question is never answered. This sounds like our own contemporary conundrum. What are we supposed to cry out with so many injustices? What should we call out first without starting an Oppression Olympics? On August 9th, Michael Brown was murdered in the middle of the day by a police officer. What shall we cry out? Nearly 70 years ago on that date, the US dropped an atomic bomb on Nagasaki, Japan killing over 80,000. Since Michael Brown’s murder, several more young black Americans have been killed by police officers. After the prophet asks the question, the response given is that people are like grass. People’s constancy is like that of a weak, little flower. We fade, wither, and die. And the breath of God, which in other passages brings life, here, brings death. Surely, people are grass. Then maybe that’s it. As I’m told often enough, justice will never come about until God reigns. And so we wait. We wait for other seedling to grow and hopefully they’ll fix some of our racist and sexist attitudes, laws, and perspectives. But that’s not the end of story. There are other prophets who have rose up and spoke about the grass’ strength. One prophet, Malvina Reynolds, disrupts the prophet’s words saying that grass doesn’t just fade and wither. Grass can also pushes through the cracks in concrete. Unwatched it can take over whole areas. In short, grass is dangerous. 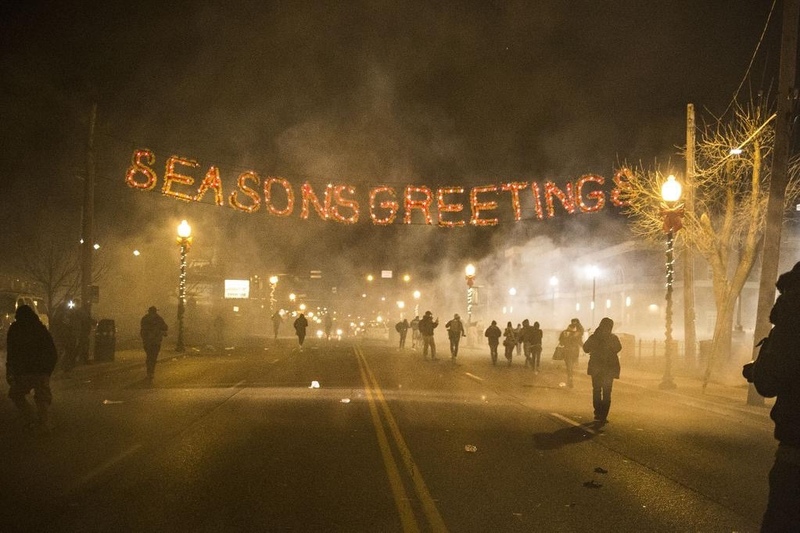 As we watch reports from Ferguson and around the US, we hear ever loudly the rustle of grass. The spirit of justice blows through the land demanding the end of police brutality against all people, but especially for black and brown persons. This wind knocks over systematic oppressions that haunt many black and brown communities. This wind pushes toward a new world, one just waiting to arrive.